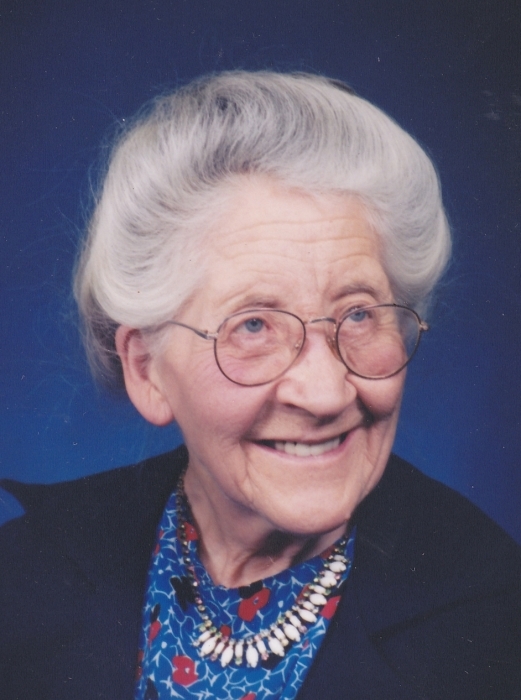 Virginia B. Hettinger, age 94, resident of rural Shelby died Wednesday, December 5, 2018 at her home surrounded by her loving family. She is finally with the God and Savior she loved and served for over 80 years. She was born April 17, 1924 to Alfred and Fleta (Pittinger) Fackler on the family homestead east of Shelby. Virginia followed God with a passion. As a young girl she accepted the gift of peace with God purchased by Jesus Christ when he gave his life to pay for her sin. She longed for everyone to know and share that gift of peace with God. That desire became the driving force of her life. She graduate from Moody Bible Institute in Chicago with the goal of becoming a missionary in Africa. Her future husband, William Hettinger, also graduated from MBI and then trained to be a missionary pilot. They were heartbroken to be rejected by the mission board because of health concerns but soon began to realize that God had a mission field prepared right here in Ohio. Shortly after her marriage in 1946, Virginia began teaching bible classes in the county schools of Plymouth, Shiloh, and Crestview. She developed and produced her own teaching material for grades 1-12. Known as "the bible teacher," she used felt figures on flannelgraph to tell bible stories to approximately 1000 children every week. She loved every child and they in turn loved her. When teaching bible classes in the local schools became illegal, she devoted her teaching to the First Baptist Church in Shelby, community vacation bible school, and Child Evangelism Fellowship. Virginia never retired from teaching about God. Even in her late 70's she crafted a hands on experience using live ducks and chickens to teach about God's unique creation. She went from school to school in Richland, Huron, and Ashland counties presenting her show-and-tell feathered chicks to every school that would open their door. Virginia was one of a kind and unique in her approach to life, ministry to people, and service to God. She is survived by daughters, Louise (Ross) Anderson of Shelby, Mary (John) Dove of Chardon, Susie (Rick) Blum of Burgettstown, PA; grandchildren, Matthew (Jacqueline Henshaw) Anderson, Marchelle (Eric) Asp, Molissa Anderson, Katie (Jeremy) Downing, Karen Dove, Laura (Ben) Francis, Stephen (Christine) Dove, Shauna (Derek) Jellsey, Karmen (Ryan Hales) Ratcliffe; seventeen great-grandchildren; brother, Clarence (Linda) Fackler of Shelby, many nieces, nephews and other relatives. In addition to her parents Virginia was preceded in death by her husband whom she wed August 30, 1946, sister Eileen (Joseph) Kirkpatrick, sister-in-law Evelyn Fackler and granddaughter Kristie Dove. A funeral service will be held 10:00 AM Tuesday, December 11, 2018 at the First Baptist Church in Shelby. Reverend Walter Keib will officiate with interment in Adams Cemetery. Friends may call at the Barkdull Funeral Home and Crematory in Shelby from 5:00 PM-7:00PM on Monday. Memorial contributions may be made to Moody Bible Institute at 820 N LaSalle Blvd, Chicago,IL 60610 or Child Evangelism Fellowship at 535 Beer Rd, Ontario, OH 44906 .